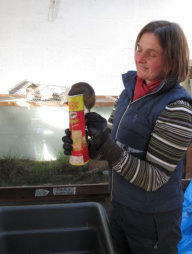 Kathy Holder: Kathy specialises in water vole captive breeding and husbandry. She has supervised the production of over 7000 water voles in her working career and has assisted the production of various papers on their ecology. She has lectured many student groups in small mammal breeding and husbandry. 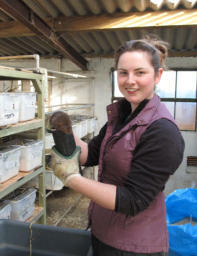 Megan Phillpott: Megan has been working for the Derek Gow Consultancy since 2007 and now manages a water vole captive breeding centre near Canterbury on behalf of the Derek Gow Consultancy. Outside of work Megan enjoys working on her family farm and fishery. She has recently taken up an interest in taxidermy. 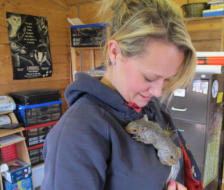 Lyn Rennie: Lyn has been part of the DGC animal husbandry team since 2011. Lyn works on the water vole breeding programme and takes care of all of the other species of British wildlife that live here. Outside of work Lyn regularly shows horses and ponies with the help of her two young children. Lavinia Wakeham: Lavinia has been working for the Derek Gow Consultancy since Spring 2010 as a part time member of the water vole breeding team. Outside of work Lavinia breeds Suffolk Punch and Connemara horses as well as running her family farm with her husband James. Daniella Siddal: Daniella joined the Derek Gow Consultancy at the beginning of 2009. 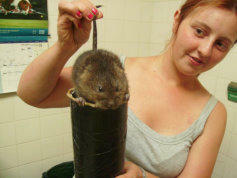 Daniella has been trained in Animal Husbandry and Care by Duchy College and is a full time animal keeper. When not at work Daniella enjoys riding her horse.